Killer of Enemies is a post-apocalyptic YA novel with a teenage Apache girl as main character. And honestly, that was about all I needed to know to pick it up. It’s a great read, with excellent worldbuilding, compelling characters and a very distinct narrative voice. I enjoyed it an absolute ton! I even asked my library to purchase the two sequels so that I can read them too (and they said yes, yaaay!). I can’t wait to see how the rest of the story goes and I think you should all pick it up for a YA that is fast-paced and well put-together and in some ways quite different from what I’ve come to expect from post-apoc and dystopian novels in general. Joseph Bruchac is an Abenaki writer with English and Slovak heritage who has written several dozen books for various ages and genres. You can visit his website here and check out his full, impressive bibliography. See, I told you this would be a short post! Whether you celebrate or not, I hope this Christmas Eve is a lovely day for you and that the last week leading up to the New Year is full of tranquility and happiness! 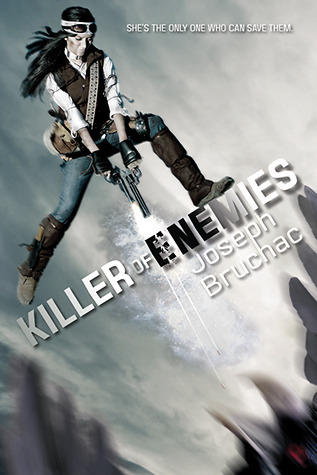 This entry was posted in Adventboost and tagged adventboost, adventboost 2017, joseph bruchac, killer of enemies by Emma Lindhagen. Bookmark the permalink.